Ever wanted to have an operator hold something throughout an animation, like a tool or a clipboard? You now have the option to parent a subcomponent to a bone on a 3D shape within the Animations tool. All you have to do is use the Sampler to choose the bone that the subcomponent will parent to-it will "stick" there during the animation, moving and even rotating with the bone. The new Person Process Flow type adds a few extra features from other types of Process Flows. It automatically creates an "Arrivals" flow where you can set the arrivals for people in your model. These arrivals are automatically connected to the "Person Flow," where people move through the logic and behaviors you've specified in the model. The Process activity allows you to represent a delay time for a process, like the Delay activity. But unlike the Delay activity, you can also specify which objects or entities are involved in the process, what state they're in during the process, and what happens when the process is preempted or resumed.
. Added a priority value to resource objects; it's used when acquiring and preempting resources. You'll notice a Condition field in the A* objects' properties. This gives you the option to have travelers either follow or ignore a path, barrier or divider based on a condition, such as a label. The barrier object has received a big update-instead of simply being a full-time barrier as before, it can now be partitioned into sections with different directions of allowed travel through each section. For example, you could partition the barrier to only allow travel through a small corridor, or you could have the barrier restrict the flow of traffic to only a northeastern direction.
. The Time Table's weekly and daily modes now use an improved graphical display. About FlexSim Software Products, Inc. FlexSim Software Products, Inc. (FSP) creates simulation software and provides simulation modeling services. As a high tech company, we are driven to create bold new advancements in simulation technology in terms of flexibility, ease-of-use, customization, 3D graphics, and more. We realize that you go into a simulation project with a need for answers. 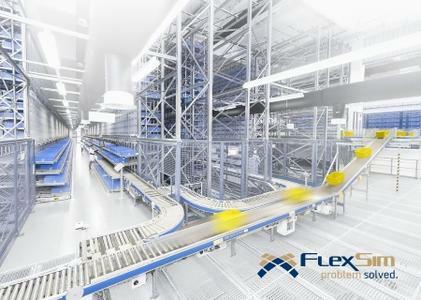 FlexSim Simulation Software (FlexSim) will meet and exceed your simulation needs. We're here to help you succeed.